One of the hardest decisions for a new saltwater aquarist is deciding what animal combinations to put in a tank. Will they get along? Can I put invertebrates in with them? Will they be OK in my size tank? Will they eat corals? Will they eat each other? It can be very intimidating to a new hobbyist trying to put it all together. This is a rough outline to show general tendencies of different fish and is not intended as the ultimate stocking planner. It should be noted that each individual fish (like any other animal) is different. What works for one community may not work in another. Exceptions are always possible with any combination and should be expected. A fish’s behavior may change as it matures and for some fish, juvenile behavior and adult behavior can be completely different. The sweet little baby Nemo may grow up to be the terror of the tank or the unlikeliest of combinations may sometimes work out to years of enjoyment. A lot of it is luck of the draw, but generalizations can certainly be made from decades of trial and error by many experienced hobbyists and many of those can share their experience with you on the aquarium advice forum. This basic guide was put together to get you going in the right direction. I have placed the more commonly used groups of fish for the home aquarium into three categories: aggressive, semi aggressive and docile. Many of these fish do not fit solidly into any one category. This is just a rough outline that may help to eliminate some of the combinations that will surely run into trouble. Specific questions on mixing of different fish should be posted on the forum. 1. Docile fish should be introduced first, followed by semi aggressive, and finally aggressive fish. The largest, most docile fish should be added first and the most aggressive fish should always be introduced last. This will allow the less aggressive animals to settle and save you a few nipped fins or worse. 2. 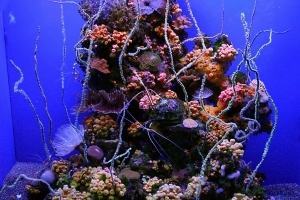 Compatibility with invertebrates and corals should also be considered if you wish to have these animals within your system. 3. Tank size should always be considered and is often ignored when adding fish to a system. Adult size of an animal should always be taken into consideration when choosing your stock. 4. Total number fish in any system differs depending on the animals you wish to have in your system, method and efficiency of filtration, eating habits, adult size and size of a system itself. The general rule of thumb is 2 inches of adult size fish per every 10 gallons. Once again, not the size they are now, but the size they will be as an adult. 5. Two fish that are the same size, color or similar body marking should not be kept together. 6. For the most part, two fish of the same species should not be kept together; however, there are exceptions. Schooling fish such as Chromis or Heniocus can be kept in small groups when room allows. Several species of Clownfish, Blennie, Gobies and some Damsels can be kept more than one to a tank, once again if room allows. 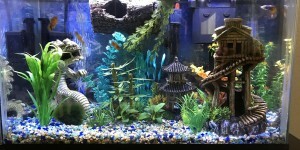 The other exceptions are fish that were caught as a mated pair and are residing in the same tank upon purchase. There are many excellent fish stores out there. But there are also some that are in it for the quick buck. Listen to what they tell you when you are researching, but also do your own homework before you buy. Post questions in the forum, and search the net for articles about the particular fish. Impulse buying leads to many premature mortalities in this hobby. Information is your best tool for building the “tank of your dreams”. Once again, the below chart is just a rough guide to get you started. It should not be used for your final stock planning. Use the info below and ask us in the forum what we think. We are glad to help you with your decision. Below are two graphs; the first is to show general information about a particular family of fish, basic eating habits, and temperament and minimum tank size. The chart also shows if a family tends to be reef and invert safe. The second graph shows some basic information about mixing different groups of fish. The information is not absolute and any fish you wish to purchase should be researched. This is just a basic guide to help with system planning, or a quick reference to see if a combination has a chance to work. Please refer specific questions to the forum. Use the number in the first column to find compatibility for that particular fish on the fish compatibility chart. *Tank sizes vary for different species, post specific questions on the forum. The number shows each family in the chart in the first column. Reference the desired combination using the numbers throughout the chart. For example Dwarf Angels are number 2. Looking through the chart, anywhere you find the number 2 that combination applies to the Dwarf Angel family. *Invert such as snails, hermits and ornamental shrimp also not recommended. **OK in large enough system.